It’s best to marinate the pork cheeks 1 day ahead of time. And everything else can be prepared while the pork cheeks are braising for 2 1/2 hours. Prepare the pork cheeks: about 1 day ahead of time, season the pork cheeks with rosemary, the garlic cloves, and zest from 1 lemon. Reserve in the fridge. Remove an hour before cooking, so they can come to room temperature. Season generously with kosher salt and pepper. Braise the pork cheeks: add a few glugs of canola oil, or any other high-temp oil, to a dutch oven over high eat. Pat the pork cheeks dry and remove excess garlic and rosemary (you can save the excess later for the carrot polenta). In two or three batches, brown the pork cheeks on all sides over medium-high heat. This may take about 10 minutes per batch. When the pork cheeks are well-browned, set them aside and add the celery, onion, and carrot to the pot and stir well. Add more oil if needed. As the vegetables begin to soften, add the sherry and deglaze. Reduce by half, then return the pork cheeks to the pan. Add the stock to almost cover the pork cheeks. Depending on the size of your pot, you may not need the entire 3 cups, or you will need to add some additional stock or water. Bring to a boil, then cover the pot and simmer on low heat for about 2 1/2 hours. Place the carrots, rosemary, chile, garlic, and bay leaf in a pot and cover with 4 cups of water. Bring to a boil, then simmer until carrots are soft, about 20 minutes. Remove the bay leaf and rosemary stalk, then blend with an immersion blender or in a regular blender. Return to the stove and add the sugar and milk. Season to taste with salt and pepper. This is the stock for your polenta. When you are ready to make the polenta, bring the stock to a boil and add the cornmeal. Stir frequently for about 20 minutes until the polenta is cooked. If it thickens too quickly, add more water. Season to taste with sugar, salt and pepper, and reserve. You may have extra polenta left over. After it dries a bit, you can slide it into squares, quickly pan fry it, and use it for another purpose! Mix the ingredients, season with salt and pepper, and reserve. Toast the pine nuts for a few minutes in a small pan over medium heat. When cool, mix with the rest of the ingredients. Season with salt, and reserve. When the pork cheeks are ready, remove from their braising juices and sear quickly in a pan over high heat, to crispen them back up a bit. Meanwhile, increase the flame on the braising juices and let them reduce over high heat. Warm 4 serving dishes. Scoop polenta into each of the dishes. 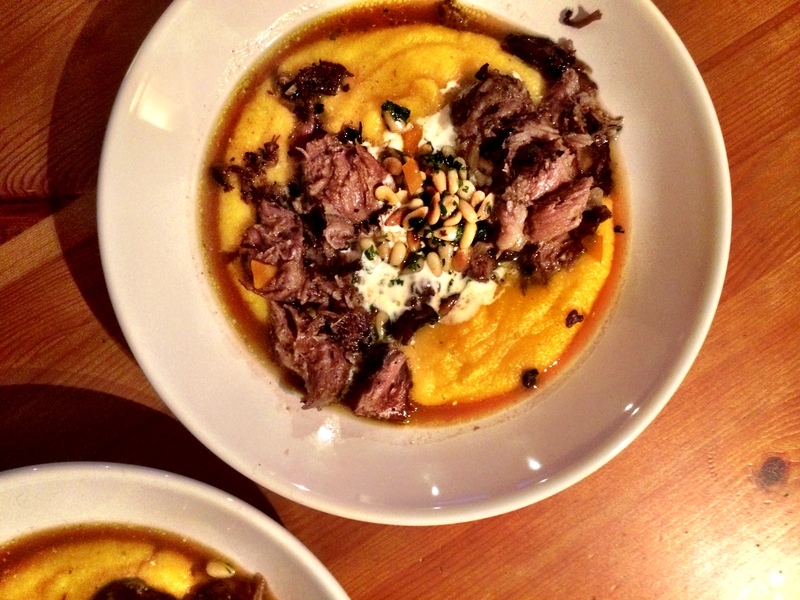 Top the polenta with the pork cheeks, a little lemon creme, and the pine nuts. Lastly, spoon the braising juices all over. Now relax, and enjoy with a nice bottle of red wine.